I don't know about you, but being a single mother I am always on the hunt for ways to save money. This year I really wanted to focus on stretching my tax refund for as long as I could in order to get the most out of it. I noticed that last year I was spending a lot of money for my contract phone plan and wanted to focus on saving money on my phone this year so I headed to my local Walmart to see what options they had available. I was searching for the best deal online and in-store and decided on the Samsung Galaxy ON5 with the Walmart Family Mobile Plus Plan. The Samsung Galaxy ON5 was on a Rollback price of $69 before taxes (regular price - $119) which is an amazing price and the Walmart Family Mobile Plus Plan was only $49.88 a month for unlimited talk, text and data (up to 10 GB of 4G LTE† then 2G), plus you get a free VUDU Movie (a $7 value, the same as a new release rental)! I couldn't believe how much money I was saving right away with this plan. Unlike contracted plans, there is no activation fee, but you do have to purchase a $19.88 SIM Kit when you first purchase the phone. Since Family Mobile bills you later, you only have to pay $19.88 when you sign up! What a great deal! I was surprised at the amazing quality of the pictures on this phone! I love taking pictures with this phone as well as checking the weather and all of my social media platforms. On my contracted phone plan, I was constantly going over on my data and having to pay overage fees which made my already expensive plan even more outrageous for my budget. I love having unlimited data (up to 10 GB of 4G LTE† then 2G) with the Walmart Family Mobile Plus Plan. It's perfect for me because I am on my phone a lot being a social media influencer and blogger. It's also really helped because Lilly likes to watch her shows on my phone when we are out running errands and she gets bored, so now I don't have to worry about going over on my data all the time! I love that you get a free VUDU movie credit as well. I can't wait to get together and have family movie night watching our free movie on our SmartTV. 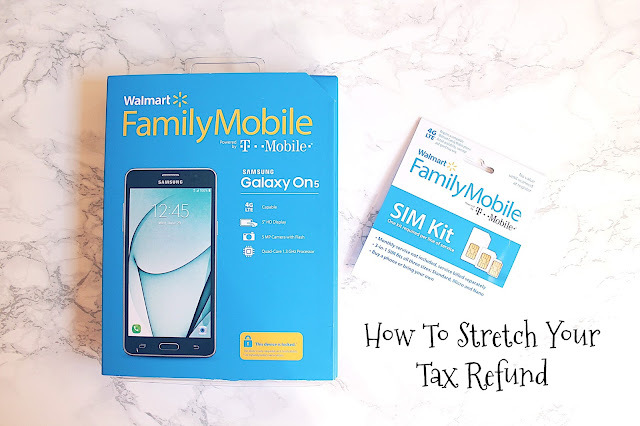 Switching to the Walmart Family Mobile Plus Plan has really helped me save my tax refund money for other expenses that will come up throughout the year and every month with a lower mobile payment. I hope you'll try them out for yourself so you can see how amazing and what a great deal they are!